Another Pendulum Art Book preview... sort of! It's time for another MonMon Memo! The 15th installment (the Digital Monster Art Book Version Pendulum Production Status Report Part 2) is a bit different, as the preview this time is more telling us about something, rather than an actual preview. 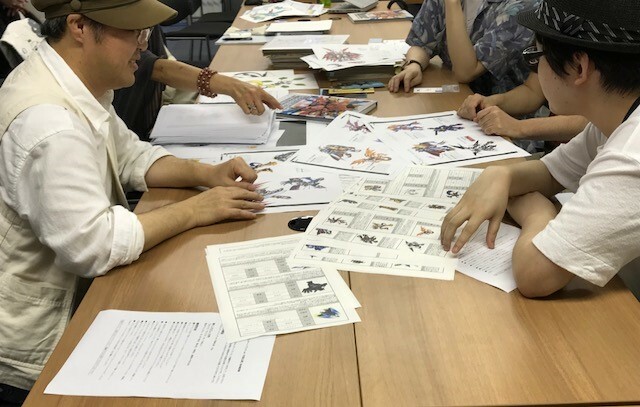 Big Dreamer Taoka describes a small event they held called the Digimon Designer Roundtable. It was a small project to gather designers who have done the official Digimon illustrations and talk about Digimon from the perspective of design. What do designers talk about? Taoka hosted it the other day, and was very excited and anxious prior to the event. He notes that it'll be in the Art Book Version Pendulum. The event was held as a discussion round-table between them all, while they were also looking at various pages and layouts of the Art Book Version Pendulum, which is full of Digimon that they've each drawn for the first time and includes things they can talk about 'now'. Taoka is currently doing his work putting together the contents of the round-table for the book (this appears to be why this MonMon Memo is less of a literal preview than prior installments), but he wanted to release a bit of info about the roundtable. 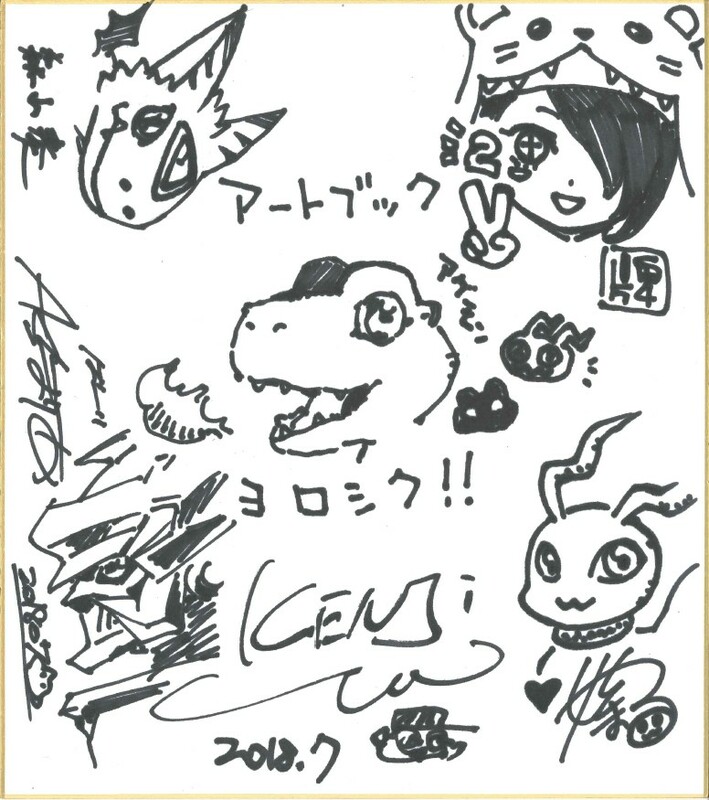 At the end of the roundtable each of them drew on a single shikishi. Taoka considers this amazingly high quality improvisational work by each of them, and considers it precious. There will be another MonMon Memo next week, but it isn't specified what it is, just that it will be 'new' information. Which Digimon is in the bottom left? Jesmon X? It's cool seeing them still acknowledge sistermon ciel. It's Dukemon X, Jesmon's head would be far more elongated. I'm seeing some very interesting Digimon on those pages like Megidramon X and Holydramon X... neither of them have come up in connection with the enw pendulum yet, so I guess that could mean that they might appear in the second wave or the book if far more exhaustive in terms of X-Antibody designs than I expected (especially since those are full size artwork for the big double pages and not just a list style overview like what we saw for the armor Digimon). That's nice but them potentially going all out on X-antibodies now kind of makes me wonder if that implies a lack of plans for a 20th anniversary pendulum X (or at least an accompanying artbook for it) because in the end there are only 118 X-antobody Digimon in total so depending on how many they put in this book they might not just have enough of them left (at least if the statements of "no overlap" holds true for potential future releases) for a book if comparable size, even if we still get a few new additions. I might just be paranoid here since the maybes are kind of piling up at this point lol. Sistermon Ciel :0 what a cutie. They seem to like her. So she'll have a art in the book? Ciel soon! I wonder if she'll come with a new description, assuming the desgin changes to giver her a sword instead of a gun, like her sprite seems to have. I don’t like Ciel and it still makes me worry that she’ll replace Noir from here on out. That said I’ll give credit where credit is due, I do like her new face and the chunk of hair over her eye. Here’s hoping her redesign is really darn good. Last edited by RogueX4; 07-20-2018 at 09:23 AM. Wow Sistermon Ciel's new hairstyle sure look cute. I keep hoping Sistermon Ciel will get some type of tongue-in-cheek DRB profile "A Digimon born from the junk data of discarded emails sent by angry foreigners..."
I really, really wish series like this and Pokémon would put together a list, or a book, of who designed which monster, even though I'm sure with counts as huge as Digimon it would be exhausting, or some even impossible to identify if too much time passes by.